The local bourse rallied on Wednesday as global stocks rose on the back of positive Chinese economic data and the resumption of trade talks between China and the USA. China released its Caixin Services PMI numbers for the month of March which came in better than forecasted at 56.8, compared to an estimated level of 55.0 and higher than the prior recording of 54.5. The Shanghai Composite Index advanced 1.28% while the Hang Seng managed to gain 1.22%. The Japanese Nikkei rose 0.97%. There was some disappointment in terms of local economic data following the release of the Standard Bank SA PMI data which showed a decline to 48.8 from a prior recording of 50.2. The rand was deterred by this data as it traded mostly firmer but primarily on the back of a weaker US dollar. The rand managed to peak at a session high of R14.10/$ before it retraced to 0.37% firmer at R14.15/$ at 17.00 CAT. On the JSE, Aspen Pharmacare [JSE:APN] came under the spotlight following news that the company was expected to receive final approvals to complete the sale of its milk-formula business. The stock gained 5.71% to close at R97.93. Sappi [JSE:SAP] advanced 3.67% to close at R67.73, while Old Mutual [JSE:OMU] added 3.51% to close at R22.70. Impala Platinum was buoyed by the surge recorded in the platinum price which saw the stock close at R61.02 after gaining 4.49%. Gold Fields [JSE:GFI] held on to its gains to close 3.78% firmer at R53.60, while coal miner Exxaro Resources [JSE:EXX] added 3.16% to close R177.73. Life Healthcare [JSE:LHC] climbed 3.01% to close at R27.70, while Bidvest [JSE:BVT] managed to post gains of 2.77% to end the day at R203.99. Index heavyweight, Naspers [JSE:NPN] also helped propel the index higher after it gained 2.13% to close at R3460.00. Listed property stocks came under pressure in today’s session with stocks such as SA Corporate Real Estate dropping 5.92% to close at R3.34%, Liberty Two Degrees [JSE:L2D] fell 4% to end the day at R6.72, and Growthpoint Properties [JSE:GRT] lost 3.2% to close at R24.20. Blue Label Telecoms [JSE:BLU] lost 3.44% to close at R3.65, while cement maker PPC Limited [JSE:PPC] weakened by 3.06% to close at R4.75. Luxury goods retailer, Richemont [JSE:CFR] retreated to close at R103.76 after losing 0.98%, while British American Tobacco [JSE:BTI] dropped 1.95% to close at R576.92. 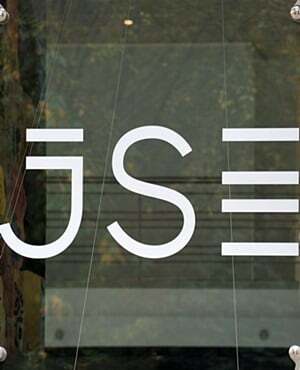 The JSE All-Share index closed 1.34% higher while the JSE Top-40 index gained 1.35%. All the major indices advanced on the day with the biggest gainer being the Resources index which advanced 2.06%. The Industrials and Financials indices gained 0.98% and 1.37% respectively. Brent crude paused towards the JSE close after having traded mostly firmer for most of today’s session. It was trading 0.09% weaker at $69.31/barrel just after the JSE close. At 17.00 CAT, Platinum was up 2.07% to trade at $868.93/Oz, Palladium had lost 2.56% to trade at $1396.73/Oz, and Gold was 0.15% weaker at $1290.47/Oz.